One of the primary goals of the ANA is to advance the study of money along educational, historical and scientific lines, as well as enhance interest in the hobby among school-age children. The following resources and lesson plans are tools for teachers. Learn more about Coins in the Classroom: Unlock the Educational Power of Money, a two-day professional development class for educators. Registration deadline is May 31, 2019. The Adopt-A-School program consists of educational kits to be used in a classroom setting. Parents, district representatives or club members can “adopt-a-school” and use the kit to teach students about the importance of numismatics while adhering to the educational curriculum. Various lessons included in the kit are geared towards different age groups, from upper elementary grades to high school. 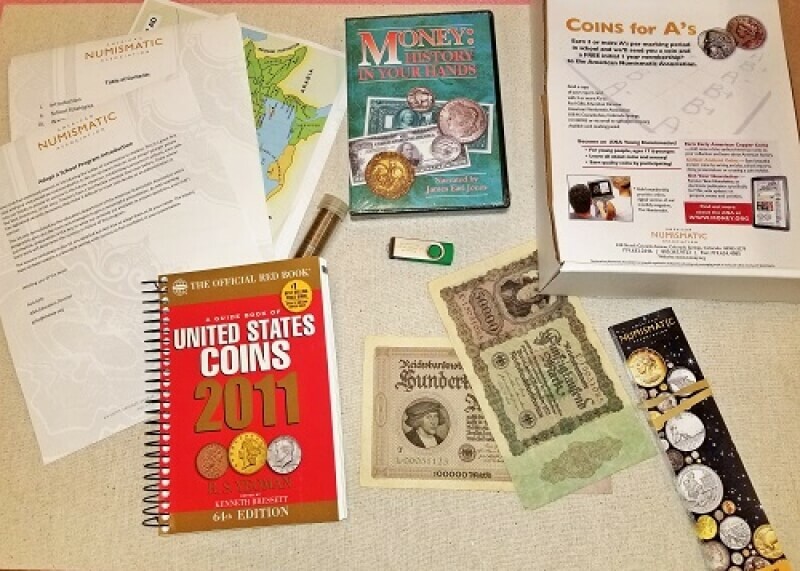 The education kit provides the lesson plans that could easily fit into a classroom schedule, meet a teacher’s goals and provide a more in-depth look at numismatics for the kids. Adopt-A-School kits are available for free to ANA member clubs – one kit per ANA club upon request. The kits can also be purchased for $24.95, postage paid. For more information or to order a kit, contact Tiffanie Bueschel at tbueschel@money.org or call (719) 482-9816. Teach your students about World War I with these educational workbooks filled with challenging and interesting activities. The dollar has been the flagship coin of the United States Mint. 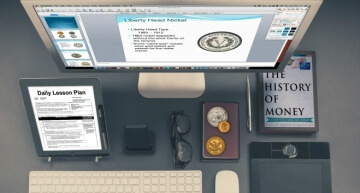 Show your students how the development of the dollar and its various designs are a window into our history. When we discuss a coin's "value," what do we really mean? This presentation takes you back to the year 1912. Help your students learn how to use a coin as a catalyst to research world, national and local events of any year. The economy is always a current event. Use this presentation to explain the cause of inflation. Show how the events of the First World War led Germany down the path of financial ruin. Use the State Quarter Program to help students learn about geography and history with a little letter composition practice included for good measure. A great culminating project after researching Roman coins. Teach how many modern-day wedding customs got their start in Rome. Use ancient Roman coins as a vehicle to recreate an archaeological dig and research rulers of the Roman Empire! The images found on coins reflect society. Challenge students to design their own coin to commemorate an event! Ever paid for an item with a twenty cent piece? Use obsolete denominations to help improve student calculations.